"Democratic Party of the Peoples" redirects here. For other uses, see People's Democratic Party (disambiguation) and Democratic People's Party (disambiguation). The Peoples' Democratic Party (Turkish: Halkların Demokratik Partisi (HDP), Kurdish: Partiya Demokratîk a Gelan), or Democratic Party of the Peoples, is a pro-minority political party in Turkey. Generally left-wing, the party places a strong emphasis on participatory democracy, radical democracy, feminism, minority rights, youth rights and egalitarianism. It is an associate member of the Party of European Socialists (PES) and consultative member of the Socialist International. Aspiring to fundamentally challenge the existing Turkish-Kurdish divide and other existing parameters in Turkish politics, the HDP was founded in 2012 as the political wing of the Peoples' Democratic Congress, a union of numerous left-wing movements that had previously fielded candidates as independents to bypass the 10% election threshold. It is in alliance with the Kurdish Democratic Regions Party (DBP), often described as the HDP's fraternal party. While the HDP claims that it represents the whole of Turkey, critics have accused the party of mainly representing the interests of the Kurdish minority in south-eastern Turkey, where the party polls the highest. From 2013 to 2015, the HDP participated in peace negotiations with the Turkish government on behalf of the Kurdistan Workers' Party (PKK) separatist militant organisation, with which it is accused of having direct links. The party operates a co-presidential system of leadership, with one chairman and one chairwoman. These chairpersons were Selahattin Demirtaş and Figen Yüksekdağ respectively until Yüksekdağ's parliamentary membership was revoked on 21 February 2017. In the 2014 presidential election, the party put forward its chairman, Selahattin Demirtaş, who won 9.77% of the vote. Despite concerns that it could fall short of the 10% election threshold, the party put forward party-lists instead of running independent candidates the subsequent June 2015 general election. Exceeding expectations, it polled at 13.12%, becoming the third largest parliamentary group. The party briefly participated in the interim election government formed by AKP Prime Minister Ahmet Davutoğlu on 28 August 2015, with HDP MPs Ali Haydar Konca and Müslüm Doğan becoming the Minister of European Union Affairs and the Minister of Development respectively. Witnessing the 2016 Turkish coup attempt and pointing out previous repression of democratic forces by martial powers, the HDP strongly opposed the coup. The HDP was first ignored and put aside of the post-coup national truce while the Turkish purges targeted alleged members of the Gülen movement. From September 2016 and forward, the Judiciary of Turkey started to submit HDP elected officials to anti-terrorism accusations. As of March 2018, the MP status of seven HDP representatives had been revoked and six more representatives, including the ex-chairman Demirtaş, remained under arrest, disturbing widely the HDP's ability to communicate and be active on the political scene. The HDP first participated in the 2014 local elections, where it ran in most provinces in western Turkey while the DBP ran in the Kurdish south-east. The two parties combined gained 6.2% of the total votes but HDP failed to win any municipalities. Selahattin Demirtaş was the party's candidate for the 2014 presidential election, where he won 9.77% of the vote with support mostly coming from south-eastern Turkey. The 21 MPs from the Peace and Democracy Party, the predecessor of the DBP, joined the HDP on 28 August 2014. For the June 2015 general election, the HDP took the decision to field candidates as a party despite the danger of potentially falling below the 10% threshold. Even though most of the politicians from HDP are secular left-wing Kurds, the candidate list included devout Muslims, socialists, Alevis, Armenians, Syriac Christians, Azerbaijanis, Circassians, Lazi, Romanis and LGBT activists. Of the 550 candidates, 268 were women. In 2015, Barış Sulu was the first openly gay parliamentary candidate in Turkey as a candidate of the HDP. The Peoples' Democratic Party originates from the Peoples' Democratic Congress (Halkların Demokratik Kongresi, HDK), a platform composed of various groups including left wing parties Revolutionary Socialist Workers' Party, Labour Party, Socialist Party of the Oppressed, Socialist Democracy Party, Socialist Party of Refoundation, the Greens and the Left Party of the Future, the Peace and Democracy Party, some far-left factions, feminist groups, LGBT groups, trade unions and ethnic initiatives representing Alevis, Armenians, and Pomaks. In the 2011 general election, the HDK fielded 61 independent candidates in order to bypass the 10% parliamentary threshold under the 'Labour, Democracy and Freedom Block'. 36 members were elected, though the election of Hatip Dicle was later annulled by the Supreme Electoral Council and this number subsequently fell to 35. Fatma Gök, one of the HDP's founding chairpersons, described the HDK as a means of providing political hope to citizens and also as a way of intervening in the Turkish political system. The HDK operated by organising conferences and congresses, establishing the HDP as a means of fulfilling their political goals and establishing a means of having political influence. The formal application of the HDK for political party status was delivered to the Ministry of the Interior on 15 October 2012. One of the party's chairpersons, Yavuz Önen, claimed that the party would be the political wing of the HDK and not a replacement for it. The HDP was described by its founding chairpersons as a party that aims to eliminate the exploitation of labour and to fundamentally re-establish a democracy in which honourable and humanitarian individuals can live together as equal citizens. It was further described as a party aiming to bring about fundamental change to the existing Capitalist system though uniting a wide range of left-wing opposition movements. Gök claimed that any political movement with similar aims to the HDK that had not merged with the party was more than welcome to do so. However, Önen claimed that the HDP would be entering elections as an individual party and not as part of a wider electoral alliance, adding that the party is itself formed of a wide coalition of political forces in the first place. Concerns were raised that the inclusion of the Kurdish nationalist HDK member Peace and Democracy Party in the HDP would raise allegations that the HDP was also a mainly Kurdish orientated party. However, Önen claimed that the HDP's key goal was to establish a different perspective of viewing the Turkish political scene and moving away from the existing 'Kurdish versus Turkish' dichotomy that had become institutionally entrenched within Turkish political perceptions. Three outstanding parliamentarians of the Peace and Democracy Party, Sebahat Tuncel, Sırrı Süreyya Önder, and Ertuğrul Kürkçü abdicated in October 2013 to join the HDP. 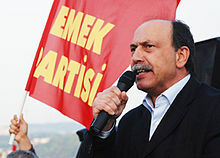 Levent Tüzel, former Labour Party chairman and independent member of parliament also joined the three to form a caucus. The Labour Party (EMEP) had been a member of the Peoples' Democratic Congress and had participated in the establishment of the HDP in 2012. However, the EMEP released a statement on 17 June 2014, announcing a split with the HDP. The split was attributed to the restructuring of the Kurdish nationalist Peace and Democracy Party into a local-only party under the new name Democratic Regions Party (DBP), while the BDP's parliamentary caucus would be integrated into the HDP. This would, in turn, require the HDP's constitution to be altered in order to ensure greater compliance and conformity with the ideology of the BDP. This caused the EMEP to formally announce their secession from the HDP, but stated that they would continue their participation with the HDK. Despite the split, the Labour Party endorsed the HDP presidential candidate Selahattin Demirtaş for the 2014 presidential election and also announced that they would not be running in the June 2015 general election. The HDP is seen as the Turkish variant of the Greek SYRIZA and the Spanish Podemos parties, similar in their anti-capitalist stance. The founders of the HDP, Yavuz Önen and Fatma Gök, both emphasised the HDP's fundamental principle of rejecting capitalism and labour exploitation for the benefit of all Turkish citizens regardless of race, gender or religion. The party in this sense is therefore secular, though has refrained from endorsing the secularism enshrined in the principles of Mustafa Kemal Atatürk. The HDP has also called for a new constitution that enshrines minority rights for Kurds, Alevis and other minorities. Kurdish peoples living in Turkey have long been a persecuted minority, or forcibly assimilated. This has led them to support separatist, leftist, and Kurdish Nationalist parties. This began with the People's Labor Party and continued with the Freedom and Equality Party in June 1992, the Freedom and Democracy Party in October 1992, the Democracy Party in 1993, the People's Democracy Party in 1994, the Democratic People's Party in 1997, the Democratic Society Party in 2005, the Peace and Democracy Party in 2008 and finally the Democratic Regions Party in 2014. Most of these parties were closed down for violating the constitution by advocating the establishment of an independent Kurdistan on Turkish soil. While the HDP is also affiliated with the Peace and Democracy Party and the Democratic Regions Party, it aims to establish a new perspective that overcomes the traditional Turkish versus Kurdish divide. The HDP instead aims to collectively represent people of all ethnic or religious backgrounds and to safeguard their civil liberties by bringing about direct democracy and an end to capitalist exploitation. The party has long advocated the establishment of local 'people's parliaments' to increase democratic representation and decentralisation of power. Much of the party's attempts to unite citizens throughout Turkey is through the opposition to the governing conservative Justice and Development Party (AKP), which the HDP has accused of being authoritarian, exploitative and discriminatory against religious minorities. The HDP's foreign policy also involves opening the border with Armenia, which has been closed since the 1990s due to Turkey's attempts to weaken Armenia economically in the Nagorno-Karabakh War. Concerns have been raised whether the HDP respects or supports the unity of the Turkish Republic, especially due to allegations that HDP works with separatist rebel organisations such as the PKK. According to the HDP, however, these claims have been disproven several times. During a conference in Selahattin Demirtaş's presidential election campaign, the HDP had caused controversy by not displaying any Turkish flags. In response, Demirtaş had maintained that the HDP respected the flag, stating that the flag represented all citizens of Turkey. On December 17, 2016, at around 21:30 (UTC+3) four masked people attacked the Peoples' Democratic Party (HDP) office in the Beylikdüzü district of Istanbul, which is located at a shopping mall. The attackers managed to overcome the security personnel and started a fire which caused the explosions of the two gas tubes inside the building. One police officer and a security guard sustained minor injuries. That same night, shots were fired by unidentified assailants at the HDP headquarters in Darıca, Kocaeli Province. Attacks on other HDP offices across the country were also reported, including İzmir, Çanakkale, Hatay, Ankara, and Erzincan. The HDP maintained talks with Abdullah Öcalan, from this talks Öcalan give a message to the congress stating that "We have never considered our movement apart from Turkey's revolutionary and socialist movements. We have always regarded ourselves as an integral part of this outcome" and "we have to consider the HDP as an integral part of the historical democratic dialogue and negotiation process. If socialism and an open democracy succeed in Turkey, it will be closely related to this democratic negotiation process.". Öcalan's niece Dilek Öcalan and Öcalan's nephew Öcalan Urfa'dan were among the HDP parliamentary candidates. The relationship between the HDP and the PKK has been put forward by the governing Justice and Development Party (AKP) as a reason why it would be better for the HDP to not gain representation in Parliament, though government journalists alleged that this would result in greater violence by the PKK and attempts to establish a separate parliament in Diyarbakır. In election posters and propaganda, the HDP has been accused of scaremongering and using the PKK to coerce voters into voting for them, stating that there would be more violence if the HDP failed to pass the election threshold. In contrast, HDP politicians also accused the AKP of scaremongering when they claimed that their affiliation to the PKK made them unfit for parliamentary representation. PKK militants have also been accused of raiding local shops and cafes in the south-east of Turkey and demanding votes for the HDP, with one civilian being wounded when a group of PKK youth militants raided a cafe in Silvan. Selahattin Demirtaş has denied having an 'organic relationship' with the PKK and claimed that the allegations of PKK militants demanding votes for the HDP from voters was untrue. According to the pro-government daily Daily Sabah, the HDP members have long been accused of voicing their support for the Kurdistan Workers' Party and glorifying terrorism committed by the organization. The members of the HDP, including the former co-chair Selahattin Demirtaş, have openly supported the PKK. In 2016, Selahattin Demirtas, whose older brother is a member of the Kurdistan Workers' Party, publicly glorified the PKK's leader Abdullah Öcalan and encouraged people to support the rebellion in his speech in Nowruz. The members of the party have been also accused of providing financial support to the PKK and attending the funeral of killed rebels. On 15 June, 2016, the HDP was criticized after its members attended the funeral of Eylem Yaşa, a suicide bomber who had killed police officers and civilians, and injured 51 others in Istanbul. On 20 July, 2018, an investigation was launched into two another deputies for attending the funeral of PKK fighters. In 2016, the Interior Ministry filed a criminal complaint about four HDP members, including former deputy Mülkiye Birtane, for making terror propaganda. On 01 March, 2018, the HDP's deputy Dilek Öcalan, the niece of Abdullah Öcalan, one of the founding members of the Kurdistan Workers' Party (PKK), was sentenced to two years and six months in prison for making terror propaganda. Two months later, the membership of two deputies, Osman Baydemir and Selma Irmak, were revoked after they were convicted and sentenced on criminal charges related to the PKK. In the same month, the former deputy Aysel Tuğluk was sentenced to ten years in prison for being a member of a terror organization (PKK). In August 2018, a former deputy Leyla Birlik fled to Greece where she reportedly sought asylum. According to the Turkish sources, she had been arrested in November 2016 for making terror propaganda and released pending trial, but she had left the country despite her travelling ban. On 11 August, 2018, one of the deputies of the party, Mahmud Togrul, was sentenced to two-and-a-half years in prison for making terror propaganda. Two months later, the former lawmaker Sırrı Süreyya Önder was sentenced to 3 years and 6 months in jail for spreading terror propaganda. The Turkish Justice and Development Party (AKP) government began a peace process with the PKK in 2013, consisting of a withdrawal of militants from Turkish soil and negotiations towards the normalisation following nearly 30 years of armed conflict between Kurdish rebels and the Turkish Armed Forces. As a strong advocate of minority rights, the HDP was involved in negotiations with both the government and also the imprisoned PKK leader Abdullah Öcalan on İmralı Island. Despite being a left-wing party, the HDP has been accused of negotiating with the conservative orientated right-wing Justice and Development Party (AKP) behind closed doors on issues mainly surrounding the Solution process to the Kurdish separatist militants. Critics of the government and the HDP alleged that such talks could lead to a potential coalition between the AKP and HDP in the event that the HDP enters parliament and the AKP does not win a majority. Such a coalition could potentially deliver Kurdish nationalist demands to the south-east of Turkey while the HDP support the AKP's long-time policy of introducing a presidential system in place of the existing parliamentary system. In March, AKP Deputy Prime Minister Bülent Arınç claimed that the HDP would be their partners in the solution process and expressed his wish to work in harmony, though also accused some HDP MPs of not working towards lasting peace with sincerity. In contrast, government minister Bekir Bozdağ accused the HDP of being part of an 'international project' intending to destabilise the government of Turkey. Relations seemed to sour in early April, where the HDP accused the AKP of staging a pre-planned attack against PKK members in the province of Ağrı aimed at gathering more votes in the upcoming general election. In response, Deputy Prime Minister Yalçın Akdoğan accused Selahattin Demirtaş of acting like a PKK spokesman. In February 2015, HDP chairwoman Figen Yüksekdağ claimed that a joint statement regarding the solution process could be made with the AKP. Delegations from the AKP and the HDP formally met in the Prime Minister's office in Dolmabahçe Palace in April 2015. The peace process was nearly disbanded after pro-Kurdish protests and riots broke out in south-eastern Turkey protesting the lack of government intervention against the advance of ISIL militants on the city of Kobanî in Syria, just south of the Turkish border. The HDP openly supported the protests, while calling for non-violence. Protestors were met with tear gas and water cannon, leading to more than 40 deaths. Prime Minister Ahmet Davutoğlu heavily criticised the HDP for calling for more protests and responded by drafting a heavily controversial domestic security bill and calling for the HDP to prove itself to be a peaceful political party. Nevertheless, the solution process continued despite the riots, with ISIL being completely ejected from Kobanî by April 2015. HDP MP Altan Tan later claimed that his party had miscalculated the consequences of calling for more protests, although his statements were met with opposition from the confederalist KCK organisation. The HDP operates a co-presidential system, whereby the party is chaired by one chairman and one chairwoman, elected during party congresses. Since its establishment in 2012, the party has had a total of six leaders, three men and three women. The following is a list of the current and previous chairpersons of the HDP, showing the names, birth and death dates where applicable and also the start and end dates of their leadership. In the Extraordinary HDP congress held on 22 June 2014, the outgoing chairperson Ertuğrul Kürkçü was by an amendment in the HDP Bylaw  awarded the status of the Honorary President. Kürkçü is the first co-president to serve in that capacity. The party has held several ordinary congresses throughout different cities, mostly focussing on provinces in south-eastern Turkey. So far, the party has had two nationwide extraordinary congresses, held in 2013 and 2014, where elections were held to select the chairpersons of the party. The party's 1st extraordinary congress was held in the Ahmet Taner Kışlalı Stadium in Ankara on 27 October 2013. The HDP Executive Board and the Congressional Preparation Council both recommended Ertuğrul Kürkçü and Sebahat Tuncel for the positions of chairman and chairwoman respectively, after which both formally assumed their positions. The congress focussed mainly in voicing support for the Gezi Park protests. A message from imprisoned PKK leader Abdullah Öcalan, emphasising the party's support for a decentralisation of power and for the establishment of localised 'people's parliaments', was also read out. 105 sitting and 25 reserve members were elected to the Party Council. The party's 2nd extraordinary congress was again held in the Ahmet Taner Kışlalı Stadium on 22 June 2014. 156 delegates were eligible to cast votes to elect the new chairman and chairwoman. Since a majority could not be secured in the first two rounds of voting, the leadership election proceeded into a third round where Selahattin Demirtaş was elected as the chairman and Figen Yüksekdağ was elected as the chairwoman of the party. Speeches by the elected leaders mainly centred on the corruption within the Turkish government and also opposition to the established political system. 100 sitting and 50 reserve members for the Party Council were elected. Outgoing chairpersons Ertuğrul Kürkçü and Sebahat Tuncel were declared Honorary Presidents of the party. Formed in 2012, the HDP has only since contested one local, one presidential and one general election. A summary of the results and number of candidates elected is shown below. At the 2014 municipal elections, HDP ran parallel to BDP, with the BDP running in Turkey's Kurdish-dominated southeast while the HDP competed in the rest of the country except Mersin Province and Konya Province where BDP launched its own candidates. After the local elections, the two parties were re-organised in a joint structure. On 28 April 2014, the entire parliamentary caucus of BDP joined HDP, whereas BDP (itself re-organised as the Democratic Regions Party by July) was assigned exclusively to representatives on the local administration level. Selahattin Demirtaş was announced as the HDP's candidate for the Presidency on 30 June. In a campaign dominated by the Solution process with Kurdish rebels, he claimed on 5 August in Van that the government of Recep Tayyip Erdoğan had not done enough to bring forward promised legislation, and that the process would collapse immediately if the AKP did not do more to bring lasting peace in the southeast. On 15 July, Demirtaş outlined his road-map for his presidency should he win the election. In a speech lasting just under an hour, he proposed that the Presidency of Religious Affairs (Diyanet) should be disbanded, that compulsory religion lessons in schools should be removed and that Cemevis (the Alevi houses of worship) should receive national recognition. He also proposed the introduction of "People's Parliaments" (Cumhur meclisleri), which would also incorporate Youth Parliaments to increase representation of young citizens. Pushing for a new constitution, Demirtaş outlined the need to end the non-representation of different cultures, languages, races and beliefs without delay to ensure national stability. Also in his speech, he praised the Gezi Park protests and displayed photos of himself during the events. He continued to direct applause to the mother of the murdered teenager Berkin Elvan, who died 269 days after being hit by a tear gas canister during the protests and falling into a coma. On the issue of the lack of Turkish flags within the hall in which he was delivering his speech, Demirtaş stated that the Turkish flag represented all citizens of Turkey. His slogan is "Bir Cumhurbaşkanı Düşün" (Imagine a President...), which is followed by several different phrases, such as "Bir Cumhurbaşkanı Düşünün Ayrımcılık yapmıyor. Birleştiriyor, barıştırıyor." (Imagine a President who doesn't Discriminate, who Unites and makes Peace) or "Bir Cumhurbaşkanı Düşünün Herkese Demokrat" (Imagine a President who is Democratic to Everybody). Most of the votes that were cast for Demirtaş were from the Kurdish south-east. Emboldened by the 9.77% of the vote won by HDP co-leader Selahattin Demirtaş in the 2014 presidential election the HDP contested the election by fielding party candidates rather than independent candidates. This was controversial since the HDP's votes would be lost in the event that the HDP failed to win above 10% of the vote. There was speculation as to whether the AKP forced Öcalan to pressure the HDP to contest the election as a party in order to boost their own number of MPs. The party charged a ₺2,000 application fee for prospective male candidates, a ₺1,000 fee for female and young candidates under the age of 27 and no fee was collected from disabled applicants. Applications for candidacy were received between 16 February and 2 March. According to a private poll conducted by the HDP in January 2015, the party needed to gather around 600,000 more supporters by the general election in order to surpass the election threshold of 10% and win 72 MPs. Polling organisations such as Metropoll, however, predicted that the party would win around 55 MPs if they won more than 10%. HDP candidates hoped that the victory of the left-wing SYRIZA in the January 2015 Greek legislative election in January would result in a boost in popularity. In order to maximise their votes, the party's co-leader Figen Yüksekdağ announced that the HDP would begin negotiations with the United June Movement, a socialist intellectual and political platform that includes left-wing parties such as the Freedom and Solidarity Party (ÖDP) and the Labour Party (EMEP). Negotiations between parties began taking place in early 2015, with the intention of forming a broad alliance rather than a strict political coalition. Although Yüksekdağ ruled out negotiating with the CHP since they were 'closed to dialogue' and Demirtaş was opposed to negotiations, CHP deputy leader Sezgin Tanrıkulu said that the CHP was open for talks and that the two parties had until 7 April to come to an agreement. Provinces in Turkey with a Kurdish-majority population. HDP rallied more than expected and gained 13.12% of the total votes cast (6,280,302 out of 46,774,793), breaking the 10% threshold, the minimum set for any Turkish political party to have its representatives sit in the Grand National Assembly of Turkey (TBMM), and securing 81 seats. The HDP carried victories in 14 out of 85 electoral districts in Turkey: Ardahan, Kars, Iğdır, Ağrı Province, Muş, Bitlis, Van, Turkey, Hakkâri, Şırnak, Siirt, Batman, Mardin, Diyarbakır and Tunceli. These electoral districts are mostly Kurdish-majority provinces. In this election, however, the HDP departed from its traditional Kurdish issues-focused role and embraced other minority ethnic and religious groups in Turkey, women's issues, LGBT and left-wing activists and political groups under its wing, promoting its appeal to a national level and drawing a wider pool of support from all over Turkey. This resulted the HDP to be not only the 4th largest political party in the Grand National Assembly of Turkey but also a formidable force in gaining the Turkish overseas votes, ranking 2nd after the AKP with 20.41% and carrying Japan, Ukraine, Greece, Poland, Italy, Switzerland, Sweden, Finland, Canada and the U.K. The HDP also derailed the AKP from being the majority party, forming a single-party government and reaching 330 seats in the Grand National Assembly of Turkey, the necessary number to enact a referendum necessary to change the constitution so that Turkey would abandon its traditional parliamentary government and instead adopt an American-style executive presidency government. This is hailed by Turkey's opposition parties and their supporters as the biggest contribution the HDP made to the Republic of Turkey. Witnessing the 2016 Turkish coup attempt and pointing out previous repression of democracy by martial powers, the HDP strongly opposed the coup. The HDP was nevertheless ignored and put aside of the post-coup national truce while the Turkish purges targeted alleged Gülenists. From September 2016 and forward the Turkish judiciary started submitting HDP supporters, staff and elected officials to anti-terrorism accusations. As of June 2017, more than 10 HDP representatives are under arrest, widely disturbing the HDP's ability to communicate and remain active in the political scene. On June 5th, the Turkish interior ministry announced that 130 people who are outside the country while being suspected of militant links will lose their citizenship unless they return to Turkey within three months and meet government standards. Three of the suspects are HDP leaders: Faysal Sarıyıldız, Tuğba Hezer, and Özdal Üçer. ^ "Parti tüzüğü" (PDF) (in Turkish). T.C. Yargıtay Cumhuriyet Başsavcılığı. Retrieved 24 February 2017. ^ "HDP Merkez Yürütme Kurulu Olağanüstü Toplantısı Sonuçları" (in Turkish). HDP.org.tr. 24 February 2017. ^ a b "Halkların Demokratik Partisi" (in Turkish). T.C. Yargıtay Cumhuriyet Başsavcılığı. Retrieved 21 February 2017. ^ "İletişim". HDP.org.tr. Retrieved 24 February 2017. ^ Nordsieck, Wolfram (2018). "Turkey". Parties and Elections in Europe. Retrieved 1 September 2018. ^ Tekdemir, Ömer (20 February 2015). "Is a socialist EU possible via left-wing populist parties such as Syriza, Podemos and the HDP?". openDemocracy. ^ a b "Parti programı" (in Turkish). HDP.org.tr. Retrieved 24 February 2017. ^ "Court orders ban on HDP election brochures for promoting 'self-governance'". 19 October 2015. Archived from the original on 20 October 2015. Retrieved 19 February 2016. ^ "Turkey arrests pro-Kurdish MPs from only party with pro-LGBT policies". PinkNews. Retrieved 8 December 2016. ^ Editor, Nick Robins-Early Associate World; Post, The Huffington (8 June 2015). "Meet The Pro-Gay, Pro-Women Party Shaking Up Turkish Politics". The Huffington Post. Retrieved 8 December 2016. ^ "Demirtaş: Çoğulculuk, Bölünmemenin Teminatıdır". Sondakika.com. 25 July 2014. Retrieved 1 August 2015. ^ "Who Are We". HDP.org. Retrieved 16 January 2019. ^ Celep 2014, p. 166. ^ "PES congratulates associate parties HDP and CHP with historic election result". Party of European Socialists. 8 June 2015. Archived from the original on 8 December 2015. ^ "Consultative parties". Socialist International. Retrieved 19 February 2016. ^ "Parties & Organisations - Progressive Alliance". Retrieved 10 February 2018. ^ "HDP Kurumsal Kimlik" (PDF). HDP.org.tr. Retrieved 24 February 2017. ^ "HDP'ê Beyannameya Xwe ya Hilbijartinê Aşkera Kir". trtnuce.com. 2015-04-21. Retrieved 2015-09-01. ^ "BDP lawmakers join sister-party HDP - POLITICS". hurriyetdailynews.com. ^ "Inclusive HDP candidate list aspires to pass 10 pct election threshold". Hurriyet Daily News. 7 April 2015. Retrieved 10 April 2015. ^ "HDP'den MHP'nin Doğu'daki Kalesine Azeri Kadın Aday". Haberler. 8 April 2015. Retrieved 10 April 2015. ^ "HDP'den Laz Aday Adayı". Bizim Kocaeli. 25 February 2015. Retrieved 10 April 2015. ^ First-ever openly gay parliamentary candidate stands for election in Turkey The Independent, 25 May 2015. Retrieved 7 June 2015. ^ Red Bilisim. "HDK Bileşeni Kurumlar - Halkların Demokratik Kongresi". Retrieved 7 June 2015. ^ a b "HDK partileşti HDP oldu". 18 October 2012. Retrieved 7 June 2015. ^ "Yavuz Önen biyografisi burada ünlülerin biyografileri burada". biyografi.net. Retrieved 2015-08-01. ^ Red Bilisim. "Halkların Demokratik Partisi (HDP) Eş Başkanları Fatma Gök ve Yavuz Önen: "Başarmaktan başka çaremiz yok" - Halkların Demokratik Kongresi". Retrieved 7 June 2015. ^ Bariş Avşar (22 October 2012). "'Kongre'si bitmeyen parti kuruldu". Radikal. Retrieved 7 June 2015. ^ "3 BDP'li vekil istifa etti". Radikal. ^ Mustafa Mayda. "Yeni HDP'ye Dair Açıklama". Emek Partisi (EMEP). Retrieved 7 June 2015. ^ Mustafa Mayda. "Halkı Temsil Edecek Cumhurbaşkanı Adayımız Selahattin Demirtaş". Emek Partisi (EMEP. Retrieved 7 June 2015. ^ Piri Medya (7 June 2015). "İşte seçimlere katılacak 31 parti". Yeni Şafak. Retrieved 7 June 2015. ^ Zeynep GÜRCANLI- Aysel ALP. "HDP seçim bildirgesini açıkladı". HÜRRİYET - TÜRKİYE'NİN AÇILIŞ SAYFASI. Retrieved 7 June 2015. ^ Dabashi, Hamid. "On the Kurdish Question". www.aljazeera.com. Retrieved 2018-11-21. ^ Cansu ÇAMLIBEL. "Otoriter lidere alternatifim". HÜRRİYET - TÜRKİYE'NİN AÇILIŞ SAYFASI. Retrieved 7 June 2015. ^ "Demirtaş'tan Türk Bayrağı mesajı". ZAMAN. 15 July 2014. Retrieved 7 June 2015. ^ "Separate blasts at three HDP buildings in Istanbul". World Bulletin. 17 December 2016. ^ "Explosions in Istanbul as Angry Mobs Storm HDP Offices". The New Arab. 18 December 2016. ^ Okan KONURALP / ANKARA. "HDP'den PKK şov". HÜRRİYET - TÜRKİYE'NİN AÇILIŞ SAYFASI. Retrieved 7 June 2015. ^ "HDP listesinde kadın adaylar ve azınlıklar öne çıkıyor". BBC Türkçe. Retrieved 7 June 2015. ^ a b "AKP officials insinuate HDP-PKK link, HDP outraged". TodaysZaman. 24 April 2015. Retrieved 7 June 2015. ^ "PKK'dan HDP için bomba seçim kehaneti". Internethaber. Retrieved 7 June 2015. ^ Ulusal Kanal (3 May 2015). "PKK'dan baraj tehdidi: HDP barajın altında kalırsa..." Ulusal Kanal. Retrieved 7 June 2015. ^ "PKK/HDP'nin korku siyaseti". 4 May 2015. Retrieved 7 June 2015. ^ "Selahattin Demirtaş Habertürk'e açıkladı: PKK ile organik bağımız yok". www.haberturk.com. 22 April 2015. Retrieved 7 June 2015. ^ "Ağrı'da AKP-HDP 'alan mücadelesi' mi yaşanıyor?". BBC Türkçe. Retrieved 7 June 2015. ^ "Pro-PKK HDP politicians' support for terror at a glance". DailySabah. Retrieved 2018-12-29. ^ "Former HDP deputy co-chair Tuğluk sentenced to 10 years in jail over 'terror organization membership' - Turkey News". Hürriyet Daily News. Retrieved 2018-12-30. ^ "Former pro-PKK HDP deputy seeks asylum in Greece". Daily Sabah. Retrieved 2018-12-27. ^ "Turkish deputy gets jail time for terrorist propaganda". Anadolu Agency. Retrieved 2018-12-29. ^ "Former HDP MP Önder turns himself in to authorities after court ruling". Hürriyet Daily News. Retrieved 2018-12-26. ^ "'AKP-HDP başkanlık sisteminde anlaştı'". 20 February 2015. Retrieved 7 June 2015. ^ DigitalSecure Ltd. HyperMedia Co. Negaresh NewsRoom Ver 5.0. "Kurdpress News Aganecy - Some HDP figures not 'sincere' in solution process: Bulent Arinc". Retrieved 7 June 2015. ^ "BEKİR BOZDAĞ: "HDP'NİN PARTİ OLARAK SEÇİME GİRMESİ BİR PROJEDİR"". Retrieved 7 June 2015. ^ "BREAKING! HDP: Negotiation Stage in Solution Process Could Begin Within 2 Weeks". Retrieved 7 June 2015. ^ Anadolu Ajansı (c) 2011. "HDP: Divisions hindering Turkey's solution process". aa.com.tr. ^ "Pro-Kurdish party leader calls for end to violence in Kobani protests". TodaysZaman. 9 October 2014. Retrieved 7 June 2015. ^ "HDP, Kobani için yine sokak çağrısı yaptı". 29 October 2014. Retrieved 7 June 2015. ^ "Turkish PM Unveils Tighter Security Steps After Deadly Protests". VOA. Retrieved 7 June 2015. ^ "Turkish PM slams pro-Kurdish HDP calls for Kobani protests". Retrieved 7 June 2015. ^ "HDP: Turkish-Kurdish solution process has passed Kobani crisis". Retrieved 7 June 2015. ^ "HDP deputy, KCK member argue over Kobani protests". DailySabah. 23 October 2014. Retrieved 7 June 2015. ^ "HDP Olağanüstü Kongresi tamamlandı: Yeni eşbaşkanlar Tuncel ve Kürkçü". Sendika.Org. Retrieved 7 June 2015. ^ "HDP Eş Genel Başkanlığı'na Selahattin Demirtaş ve Figen Yüksekdağ seçildi". Radikal. Retrieved 7 June 2015. ^ Cengiz, Orhan Kemal (31 October 2013). "New Kurdish Party Could Impact Local Turkish Elections". Sibel Utku Bila (trans.). Al-Monitor. Retrieved 24 February 2014. ^ "BDP milletvekilleri HDP'ye katıldı". Al-Monitor. 28 April 2014. Retrieved 24 February 2014. ^ "BDP artık Meclis'te yok". odatv.com. Retrieved 7 June 2015. ^ "Demirtaş: Barış sürecinin bozulmaması gerekir – Milliyet Haber". Milliyet.com.tr. ^ a b "'Diyanet kaldırılmalı, cemevleri yasal statüye kavuşturulmalı'". Yurtgazetesi.com.tr. ^ Temmuz 15, 2014 (15 July 2014). "Demirtaş'tan Türk bayrağı mesajı- Sözcü Gazetesi". Sozcu.com.tr. ^ ali (15 July 2014). "Selahattin Demirtaş Yol Haritasını Açıkladı". Wanhaber.com. ^ "Demirtaş Köşk için yol haritasını açıkladı". Dunya.com. 15 July 2014. ^ "Demirtaş yol haritasını açıkladı – TG". Turkiyegazetesi.com.tr. 15 July 2014. ^ "nediyor.com". nediyor.com. Archived from the original on 6 July 2015. Retrieved 7 June 2015. ^ "Aday Adaylarından partilerin alacakları ücretler". Siirtliler. 14 February 2015. Archived from the original on 20 May 2015. Retrieved 7 June 2015. ^ "HDP'nin 'yeni' oy kaynağı!". Radikal. Retrieved 7 June 2015. ^ Oktay Özilhan. "İşte Demirtaş'ın elindeki anket:Baraj için 600 bin oy daha !". Taraf Gazetesi. Archived from the original on 6 April 2015. Retrieved 7 June 2015. ^ "HDP ve genel seçimler üzerine 7 soru". www.haberturk.com. 31 January 2015. Retrieved 7 June 2015. ^ "Syriza'nın Seçim Başarısı HDP'yi Ümitlendirdi". Haberler.com. 26 January 2015. Retrieved 7 June 2015. ^ "BBC: Seçimler için Türkiye solunda ittifak arayışları". Ensonhaber. Retrieved 7 June 2015. ^ thuffman (6 June 2017). "Kurdish-backed militia launches Raqqa operation as another declares war on Turkey". Retrieved 10 February 2018. ^ "Hürriyet Daily News". Hürriyet Daily News. Archived from the original on 27 September 2017. Retrieved 10 February 2018. ^ "Opposition HDP lawmaker Besime Konca released from prison". Hürriyet Daily News. Retrieved 10 February 2018. Celep, Ödül (2014). "Can the Kurdish Left contribute to Turkey's democratization?" (PDF). Insight Turkey. 16 (3): 165–180.